It is always nice to have some quality aftermarket insignia decals. This is especially true if wanting to do more than one subject from a sheet that only offers insignia for one. Most will use them to replace less than satisfactory kit decals. This sheet carries a variety of sizes and there is a very nice pair of charts. 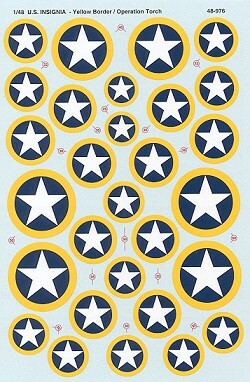 One matches insignia size to the aircraft that used them and the other matches the aircraft to the insignia size it carried. As always, these are the most commonly used and you'll undoubtedly be able to find exceptions. If you would like your product reviewed fairly and quickly by a site that has over 250,000 visits a month, please contact me or see other details in the Note to Contributors.